Every good monster movie deserves a sequel, and with few exceptions they get a crappy one. Predator 2 is right in line with that legacy, a lackluster (and Schwarzenegger-free) action flick that steals every page it can from the Aliens playbook. 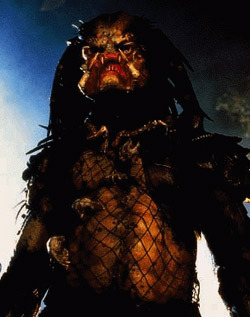 Since Predator took place in the jungle, Hollywood's sense of irony dictates that the sequel should take place in the city: In this case, Los Angeles, where a bloody gang war is underway. But the cops (notably renegade do-gooder Danny Glover) can't quite reconcile the body count, and it isn't long until they start to realize that another force is at work, which might explain the metallic bits that no one can identify and the corpses missing all their vital organs. For those action film fans who think that Steven Seagal is indestructible, I highly recommend you see Executive Decision, a cheese-o-rama of an action flick that gives Seagal seventh billing and a quick ride to Action Hero Heaven. No, this is not a "Steven Seagal Movie." It's a "Kurt Russell Movie"--the New Kurt Russell, the tough-yet-vulnerable Kurt Russell, the Kurt Russell a la Bruce Willis-type with whom we're about to be deluged, like it or not (answer: probably not). 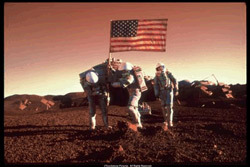 Mission to Mars starts out with so much promise, it's hard to believe it could be anything but successful. The film has already taken a lot of flack for appearing to be a ripoff of 2001: A Space Odyssey, but maybe, I thought, it would transcend Kubrick's early sci-fi drama and put a new spin on things. Maybe blend it with a little Armageddon - you know, do the space movie right for once. In 2020, the first manned mission to Mars is about to launch. Under the command of Luke Graham (Don Cheadle), the craft lands without a hitch, and within days they've made a startling discovery. A little radar probing turns up a strange metal just under the surface of Mars, and a mysterious disaster quickly wipes out the crew.